Captain Jeff knows where the Halibut live! The Halibut found off of the West Coast of Vancouver Island in the Tofino and Ucluelet offshore areas are a combination of migratory and resident fish. 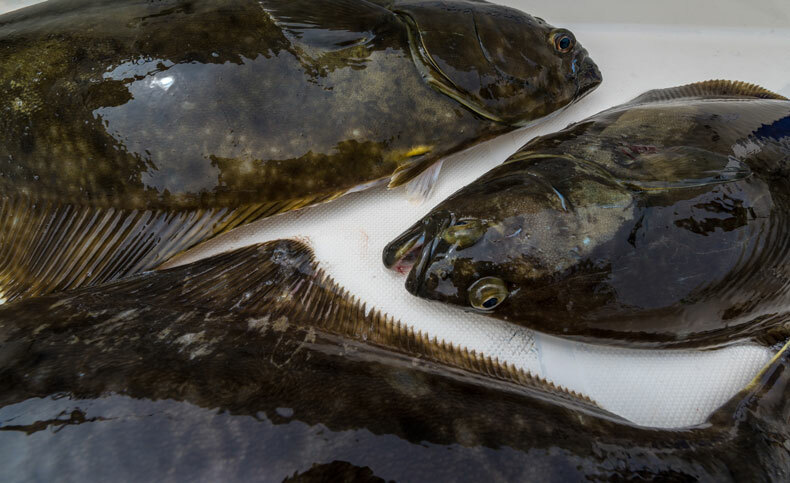 The majority of our halibut fishing is done on the Tofino offshore banks where bait fish school and large numbers of “chicken halibut” feed from March through to October. The majority are perfect eaters in the 20-50 lb range. There are opportunities for larger Trophy Halibut in the 80lb plus range. If you are interested in fishing for Trophy Halibut, we suggest considering the 2 day or 3 day packages. Read our rates & packages. Fishing techniques for these Halibut consist of both trolling close or on the bottom with salmon fishing gear or drift fishing with stiffer rods, jigging artificial or real bait on a spreader bar. Often while we are fishing for Halibut & Salmon, we catch cod fish, octopus, and bottom dwelling rock fish that all work very well for Halibut bait as well. The oils from these fresh baits leaches out into the water and currents and draws in the Halibut from great distances. West Coast Vancouver Island Halibut are also found in and around the protected waters off of Tofino and Clayoquot Sound and it is not uncommon to catch halibut while fishing for salmon closer to shore. Often our one day salmon fishing trips have a good chance of catching a West Coast Vancouver Island Halibut. Ready to go on a Halibut Fishing Charter in Tofino? 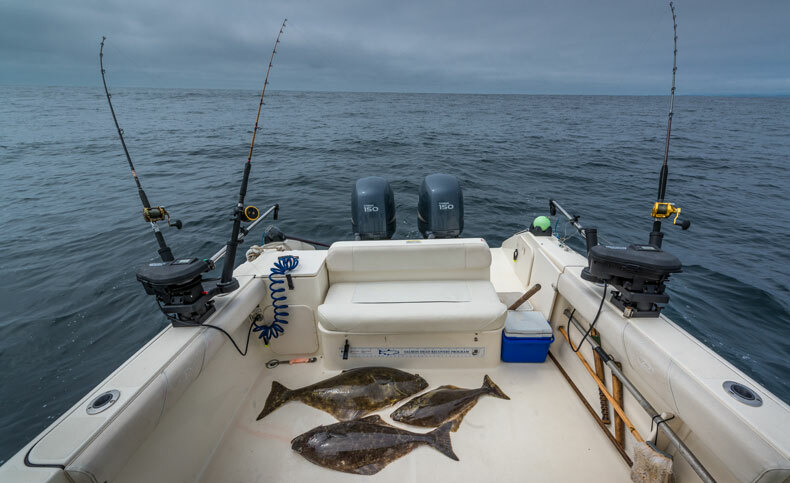 Braedy Mack Charters has everything you need for an exciting, comfortable Tofino halibut fishing charter. Brand new top of the line level wind reels with braided line and stiff Shakespeare rods make fighting these magnificent fish an experience you will remember. Professionally processed flash frozen at -50 degrees, vacuum packed and optionally smoked make the halibut a premium treat for family and friends when you get home. Call for a halibut fishing charter toll free 1-888-732-3077, or contact us via email using our online form.